104:   * Return value is '0' when it returns directly from here. 105:   * Return value is '1' when it returns after a vm exit through vmx_longjmp. 129:   * Return to vmm context through vmx_setjmp() with a value of 'retval'. 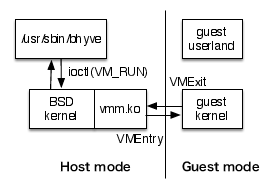 156:    * Save guest state that is not automatically saved in the vmcs.